This publication should be cited as: Kumi, N. B. 2014. Ghana's challenges in a new diplomatic environment. GREAT Insights, Volume 3, Issue 3. March 2014. Modern developments, including powerful global media, have variously transformed the conduct of diplomacy and forced diplomatic practitioners to measure up and deliver in the best interest of their respective peoples. Understanding modern diplomacy’s complexities is imperative for effective diplomatic manoeuvres. The purpose of diplomacy, throughout the ages and at different levels of societal evolution, whether at inter-personal, inter-communal, or eventually at international level, has always been to find a solution to an identified problem which is common to the parties engaged. That endeavour has led to a steady development of international relationships aimed at fostering understanding and promoting tolerance, albeit with limited success (1). Since then, new factors have emerged, including an ever-increasing number of varied players in current complex international relations, coupled with the power of modern media and the speed with which news travel in our times (2). With these two significant developments, the very concept of state representation is being gradually transformed and the traditional role, which hitherto was assigned to diplomatic envoys, as sole representatives of the interests of a sending state in a receiving state or in an international forum, is being effectively eroded. It is important to note that many of these new players are beyond state control and not hesitant about making public what diplomatic envoys would rather carry confidentially, to the authorities of their respective states. The result is what is now described by experts as ‘Track two diplomacy’. Track two diplomatic initiatives, which, inter alia, engender greater inter-connectivity, are being steadily embraced (3). These challenges call for deep reflection on how to handle diplomacy in this new environment, i.e. how to practice diplomacy in an era of transparency. Whilst new international actors and the information revolution necessarily alter the diplomat’s old monopoly on knowledge and conduct of international relations, some arrangements need to be put in place to preserve a good measure of the aura that surrounds the all important persona of the ‘Excellencies’. This is imperative against the backdrop of timeless reality of need for secrecy or real transparency behind closed doors, for the reality that diplomacy sometimes is a‘dirty’ business because the alternative is war, cannot and should not be overlooked. What matters most then, for a professional diplomat, is the ability to process available information with a view to securing the interest of the sending country and by extension its citizens. It is pertinent to note the emphasis placed nowadays on the need for diplomatic endeavours to impact more directly on the lives of individuals (4). The power of global media, coupled with intertwined international socio-economic interests has greatly contributed to the prominence of public diplomacy, which directly targets the people (5). Modern diplomacy therefore requires practitioners who constantly update their capacity for strategic analysis and negotiations. Knowledge is thus key to effective diplomatic practice (6). It is indeed imperative in a world where political and socio-economic problems bring in their wake unfortunate developments such as political instability, food insecurity, conflicts of significant proportions, harrowing violation of human rights and the resultant displacement of considerable numbers of affected persons, not to mention growing inequalities within and between nations (7). The dearth of knowledge and relevant strategies to overcome the afore-mentioned challenges, many of which often confront African countries, imposes high responsibility on African leaders as they position their countries to benefit from globalisation. In that regard, diplomats as frontline agents of leadership, have to be savvy in recommending international best practices, bearing in mind the shift in the hierarchy of modern instruments of power as well as in global balance of power mainly towards Asia and emerging economies. In their strategic submissions, African diplomats could, for example, legitimately question the point of the Millennium Development Goals and general aid to African countries in the face of stronger opposing actions at play. In other words, light needs to be thrown on to the double talk of the haves. It is worth noting that hitherto, a number of factors, including bad governance in a number of African countries, have resulted in Africa’s continued dependence on foreign expertise and services which in turn has stifled creativity towards resolving the myriad of national problems that continue to defy solution. Indeed not only do problems such as poverty, food insecurity and conflict remain intractable, they are even intensifying and, in some cases, taking on alarming proportions. Meanwhile, the continent has no choice but to operate in the global space where teams of unequal strength are at play. One has natural resources, but the other has in addition to the finance, the technical know-how and the power. The challenge then, for Africa, is how to constructively make the playing field fairer. It might be still unequal, but it must be fair. In that regard, Africa cannot afford to underestimate the increased relevance of multilateralism and the particular attention given to international development cooperation in several spheres of human endeavour. International Development Cooperation has been a dominant feature of international relations since the fifties especially when Europe chose to put emphasis on regional economic integration (8). Later, the urgent need to extend economic development cooperation to the then newly-independent states following an accelerated decolonisation process in the late fifties and throughout the sixties catapulted international development cooperation to prominence in diplomatic interactions (9). In fact the concepts of soft power and harmony diplomacy, which are both relatively recent identified approaches in diplomatic practice, are based on what rich and powerful countries can do with their resources, especially their expertise and financial wherewithal, to influence developments in less developed countries without resorting to hard and cold tactics, including war (10). Such approaches, which come with different methodologies, often aim at an apparent win-win situation and are therefore shunned by only a few discerning countries. For Ghana to effectively operate in the new diplomatic environment and maximise the country’s benefits from the development opportunities that could accrue from there, it is first imperative for the political leadership to be aware of its emergence and the related operationalisation. In that regard, it does not appear that Ghana has done any recent major review of its development philosophy in relation to its foreign policy and diplomatic strategies. Up until now, Ghana does not appear to have weaned itself from the ‘Guggisberg Economy’ that it inherited from the colonial era, i.e. exports are predominantly in their raw form. This is particularly stark with regard to Ghana’s agricultural as well as mineral and oil production, which constitute the bulk of Ghana’s exports. Meanwhile the country relies heavily on importation of virtually everything that Ghanaians consume, thus making the country extremely vulnerable (11). It is definitely time to re-examine Ghana’s relationships with its so-called development partners with a view to realising the value addition objective which could give the Ghanaian economy a significant boost. A good strategy of value addition would undoubtedly help reduce unemployment with its attendant social challenges. The role of the modern Ghanaian envoy in this regard should be to proffer ideas on how Ghana’s relationships with its partners would assure a realisation of the value addition objective. Secondly, it is pertinent to note that the continued over-reliance on development partners for financial support is hurting the country, with serious consequences particularly on Ghana’s balance of payment accounts and a disturbing reliance on deficit financing. It is common knowledge that Ghana’s imports, in value and volume terms, continue to far exceed its export revenues even in the wake of oil discovery and exploitation (12). What has become of Ghana’s practical application of the concept of international development cooperation, I dare say, is its near absolute dependence on foreign goods and services with dire balance of payment challenges. The concern therefore should be to find a means of harnessing modern diplomacy to urgently address the aforementioned development challenges. Ghana would have a lot to gain if it took a critical look at the value of its relationships with its development partners, particularly with a view to redress the structural defects in its economy. International development cooperation should result in win-win relationships built on fair trade and equitable, not equal, access to markets. Ghana’s envoys, both state and non-state actors, should, as forerunners in the new scheme of diplomacy and development, be spearheading negotiations that could lead to an appreciable level of value addition and better terms of trade with positive consequences on the country’s balance of payments. Ghana has had a chequered history of economic diplomacy. Relationships forged with foreign development partners have not benefitted the citizens. This unfortunate situation can, to a large extent, be reversed through a conscious effort by the country’s leaders to change its development orientation and empower its diplomatic agents to operate likewise in favour of relationships that support the country to make better use of its abundant natural resources. 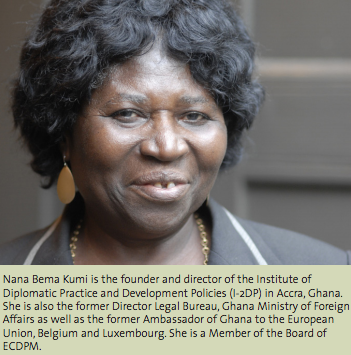 Nana Bema Kumi is the founder and director of the Institute of Diplomatic Practice and Development Policies (I-2DP) in Accra, Ghana. She is also the former Director Legal Bureau, Ghana Ministry of Foreign Affairs as well as the former Ambassador of Ghana to the European Union, Belgium and Luxembourg.” She is a Member of the Board of ECDPM. Asafu-Adjaye, J. 2010. Oil Production and Ghana’s Economy: What Can We Expect? Ghana Policy Journal, 435-49. Badibanga, T., Xinshen, D., Roe, T., & Somwaru, A. 2013. Measuring Strucutral Change: The Case of China, Malaysia, and Ghana. Journal Of Developing Areas, 47(1), 373-393. doi:10.1353/jda.2013.0013. Cheng, J. 2012. Convincing the World of China’s Tradition to Pursue Universal Harmony. Journal Of Chinese Political Science, 17(2), 165-185. doi: 10.1007/s11366-012-9191-5. Cull, N. J. 2010. Public diplomacy: Seven lessons for its future from its past. Place Branding & Public Diplomacy, 6(1), 11-17. doi:10.1057/pb.2010.4. Emmerich, H. 1969. Complexities of Administered Diplomacy. Public Administration Review, 29(6), 567. Geybullayeva, A. 2012. Nagorno Karabakh 2.0: How New Media and Track Two Diplomacy Initiatives are Fostering Change. Journal Of Muslim Minority Affairs, 32(2), 176-185. doi:10.1080/13602004.2012.694663. LI, Z. 2005. Peace, Development and Cooperation—Banner for China’s Diplomacy in the New Era. Chinese Journal Of International Law, 4(2), 677-683. Lindemann, M. 2011. The Discreet Charm of the Diplomatic Archive*. German History, 29(2), 283-30. Roberts, W. R. 2006. The Evolution of Diplomacy. Mediterranean Quarterly, 17(3), 55-64. doi: 10.1215/10474552-2006-015. Six, C. 2009. The Rise of Postcolonial States as Donors: a challenge to the development paradigm? Third World Quarterly, 30(6), 1103-1121. doi: 10.1080/01436590903037366.